Today we had a great session with members of NTW's community TEAMs from across Wales. People who've been involved in productions as marketing advocates, as workshop participants, as Curtain Twitchers! (for the Beach), Coffin Carriers (in the Valleys) and overall National Theatre Wales enthusiasts, met at our offices to talk about what they'd like to see next in their communities and across Wales. I agreed at the session to open a new forum on here talking about what shows could happen next. For our launch year we had the Big Idea of a theatre map of Wales - twelve different shows in twelve different locations across the country. It's been a very exciting year so far and there's still half of the year to go. But it's also time to think about 'what next'. Some of the ideas that came up in the TEAM session included. One of my big questions for next year is - How do we get our shows 'on the move' to many places (e.g through touring, through digital transmission, or in other ways) while keeping the link to locations and communities that has been one of our strengths so far. We have loads of good ideas from artists - we have about 40 possible projects in development. We will probably be able to do about 6 of them (our launch year of 12 shows joined up two years of funding). So there are going to be tough choices to make. However, it's a great position to be in - to have lots of good projects to choose from! And there's always room for more good ideas. So what are the things that you would like to see happen? What are the qualities that you feel a 'National Theatre Wales' show should have? Are there places that are a priority for us to go to, or stories that are urgent for us to tell? And what other kinds of activities (such as workshops, online activity, debates, etc) would you like to see going on? Thanks Kath. We did some R and D with Dafydd a couple of weeks ago, so you're on the mark there! Will keep thinking about the ways to work with more writers - I want to make sure where possible we give full productions to writers - after all, that's really what most writers want - but of course that limits numbers of people we can produce. It's a tough one... But maybe more projects like 'The Beach' where the writers involved were relatively 'emerging' and got to try something very different together...? While not the most knowledgable of theatre goers, I think there needs to be something about society and it's responsibilities to where we live. The issue for me in general is the consumption of product and resources. While I realise this isn't the most exciting of issues I think it could be one of the most challenging subjects to approach and making it publicly engaging would be something quite special. I understand people will say this is/has been done through meanings within shows but I wonder if it should be more obvious? Predictably, like Katherine, I'd like to see more playwrights represented next year. Rather than unearthing 'lost gems' I'd like you to spend time 'discovering gems'! See what I did there? It's important NTW retains it's broad-church ethos, but it is at risk of distorting the theatrical landscape where, NTW occupies the fringe with avant-garde-experimental-multi-media-cross-discipline-theatre in Wales, and the actual fringe occupies the space of putting on traditional plays and nuturing writers. See the work that 3D, Undeb, Dirty Protest, feel the need to do. So how about a strong piece of published theatre by someone like Med Barker, that could fulfill the international principle that is at the core of NTW. A piece of work that can be re-staged internationally that takes Wales to places it never gets. As for more dance? It's interesting that was raised, but haven't we already got a National Dance Company for Wales that's reasonably well funded? Are we stretching what we want NTW to provide for us? And finally. The day a javelin thrower goes to his funding body asking to go to Slovenia and gets told 'Sorry because of how much money we're throwing at theatre these days, we're only able to a offer you a third of what you've applied for' will I be remotely interested in the arts celebrating the Olympics. I totally agree with the points made by Tim Price and the others. I know that the launch year was focused on establishing the NTW and I applaud the brave and often successful choices that were made, though I sometimes feel that the NTW is wasting an opportunity. It would be nice to think that the second year programme would have less focus on Welsh identity and more emphasis on Welsh talent. As a Welshman I am aware of my nationality yet I do not wonder the wet and windy streets whistling 'Calon lan', clutching a coal dust drenched leek, in other words it does not occupy every thought and passion in my head. Our identity would be better served by celebrating the talent and ability of Wales not what it is to be Welsh. Personally I enjoy theatre for many reasons and I feel that this obsession with our 'Welshness' can only hold the NTW back. It can sometimes be seen as isolated thinking by others outside of Wales, plus this sort of patriotic introspection is not seen with other national theatres; epecially the NT. I enjoyed 'Good night out..' but felt that it was sometimes guilty of unintentionally underestimating the audience. Was it a production for people who wouldn't normally go to the theatre? If so I hope I am right in thinking that they would have had an equally good night out watching a more established play, Pinter, Beckett etc? With regards to the second year programme has anyone mentioned, dare I say it...Shakespeare? How wonderful would it be to see the National Theatre of Wales in a production of a great Shakespeare play! I would like to see a balanced mix of old and new, giving new writers a chance and giving new Actors a chance to perform in classics and potential classics. And on the subject of new Actors, could the NTW casting policy practice what it preaches and at least audition people who didn't train at the Royal col and other drama schools. I have a number of Actor friends from all over Wales who applied for every show and did not even get an audition. It is frustrating as there are many Actors of ability who did not train at an accredited school. I look forward to the rest of the shows and what the NTW have in store for us. If anyone reads this I apologise for my rant. Thanks everyone for your thoughts so far. Keep them coming! It's all very useful. Max, don't apologise for ranting - you make an important and thought-through argument. In our first year, we've tried to avoid getting stuck in questions of identity by using a wide range of places as our starting point for theatre-making, but you are right we haven't tended to focus on the existing canon and there is an understandable desire from actors and other artists to get a chance to work across the spectrum. On the subject of actors, we do look at all the CVs that are sent to us, and we've auditioned hundreds and hundreds of people, including a good number who weren't from accredited drama schools. However, I would agree that there's been a high proportion of Welsh College graduates in our shows so far. This is partly just a credit to Welsh College, who have been producing some very good actors in the last few years. However, it may be helped by the fact that we get to see a lot of Welsh College student productions, and so get to see these actors not just in auditions but in full length shows - we get to know their strengths and range. So, for actors in general, keep on inviting us to shows that you are in. We do come to an awful lot of shows that are on - particularly the emerging companies that have been set up by actors, writers and directors, and it's the best way for us to get to know your work. On the subject of new writing and new writers - I think there's a pretty good range of new writing in the first year - from emerging talent like Bethan Marlowe and Rhiannon Cousins to more established voices like Gary Owen and Alan Harris, to writers who are crossing over into theatre like Owen Sheers. However, I do agree with Tim's point (which is linked to Max's I think) that we need to build strong, long-term relationships with writers at the different stages of their careers. We have quite a few scripts in the 'seed-commission' stage at the moment. The difficulty comes, of course, with the fact that there is only a limited number that we will be able to fully produce. It's a delicate balance between supporting ideas and focusing on our core job of putting on shows. I'm trying to raise some extra funds at the moment to help develop more resources for development of ideas. Tim, how about a commission to write the script for an experimental multi-media dance theatre piece about the former East German shot-putting team. We could put it on in the Millennium Stadium. The Telegraph would love it!! Yes! And we can blind-fold the audience, drag them onto the pitch, give them each a shot-put and they can all participate until actual death. I can see the reviews now 'Fifteen people died during the performance but, the location is the real star of the show'. 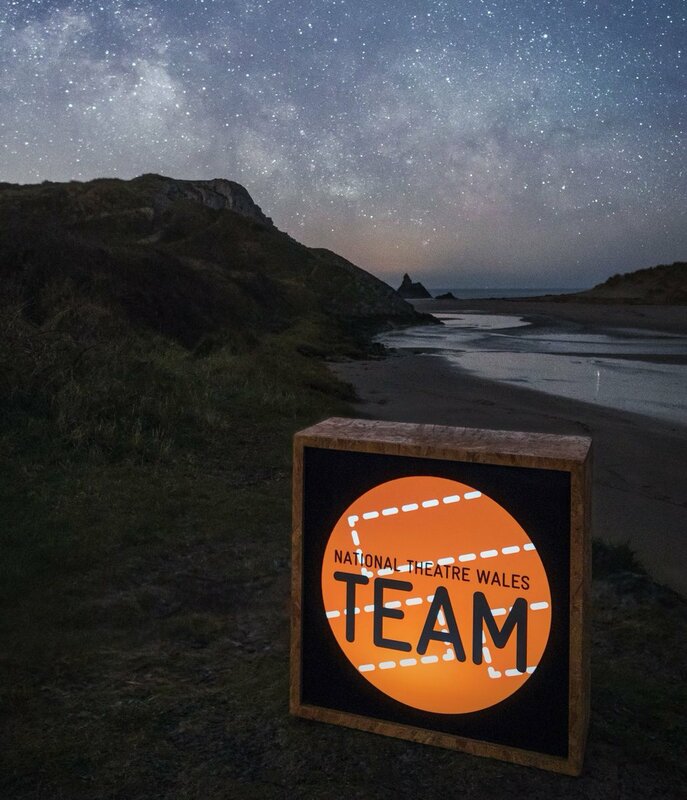 NTW has so far enabled established Welsh theatre practitioners to produce five fully realised and exceptional shows which would otherwise simply not have been possible in Wales. In addition, "The Beach" used emerging talent and a host of curtain twitchers to make something special. The communities' involvement has been a worthwhile element of NTW and I have relished the fresh presentation of these communities to both visitors and locals. I would love to see this model continue next year. The four upcoming shows from November to February signal a change of emphasis because they are all led by visiting artists and companies. This is potentially exciting, but we must wait and see. As for plays, I would welcome further co-productions which extend the other companies' activities, such as with Sherman Cymru in Bridgend now. To pursue Tim Price's suggestion, perhaps something along the lines of co-producing a Meredydd Barker text with Clwyd Theatr Cymru, for example. Dance has already happily appeared in Barmouth and Swansea and I do not support Tim Price's fatwa. It is obvious from the high standard of NTW productions that your project development practices are very sound. However, at an activity level of just six productions a year, any adverse critical reaction to an individual show might receive undue attention, so I hope that six is an absolute minimum. Finally, just to say I'm eagerly looking forward to future NTW shows! Are there places that are a priority for us to go to? To the border areas are going to deliver a mighty “no” in the refendum. Get every community/ youth group in Flintshire together on a piece on the relationship between Wales & Liverpool. Invite Tim Baker to direct.